Too funny! Just push their container into the middle of their driveway, so when they come or go, must move. They get the hint! Ha!!! Garage sale items constantly out on drive way. The left turn signal from us 41 s to s Sanford seems to have been shortened to only 3 cars can make a turn before it changes to red. I know this has been fixed previously. Maybe a little longer green arrow please. Good afternoon my name is Annbrielle Dombai. I reside at 3613 Bartigon ave 34286. Last August I put in a request for a tree that had grown onto her property from the lot next-door a gentleman came out a few days later gave me his information and told me it was being looked at. 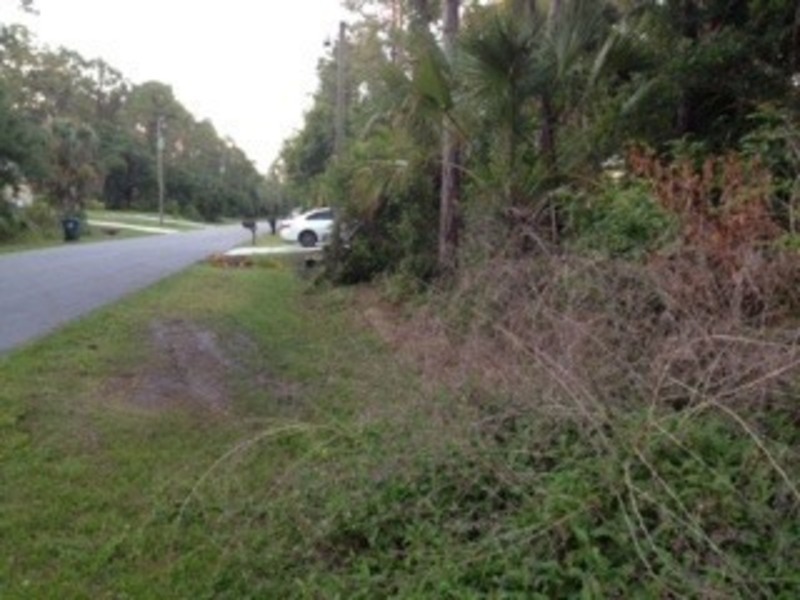 In October I got a notification that they had not been able to get a hold of the property owner so they were sending it over to a contractor to come and cut the trees down. No one ever came so I contacted the city Northport again I was told January 3 someone was given the contract to come out and cut the trees it is now April 16 and no one has been out here no one will return any of my phone calls I’ve emailed personally the neighborhood Development person who came out that day and he has not emailed me back. This tree is out of control and I don’t want to keep getting the runaround I’m very upset at the city of North Port that I keep just getting told it’s been taken care of it is April 16 development person who came out that day and he has not emailed me back. This tree is out of control and I don’t want to keep getting the runaround I’m very upset at the city of Northport that I keep just getting told it’s been taken care of it is April 16 and I submitted this last August. I would like this resolved immediately. We’ve lost this basically the side yard of our house and part of our front yard. It is also growing up and wrapped itself around the electric pole. I would like this resolved immediately. We’ve lost this basically the side yard of our house and part of our front yard. It is also growing up and wrapped itself around the electric pole. When facing your hose is it the lot to the left or right? I have been asked this question so many times already. It is to the right. There has been multiple cases opened and closed with no one actually coming to trim it. I was told 3x now it was given to a contractor to come and cut. When facing your house is it to the right or left? Nothing is being done here. Dumpster is full, toilet lying in yard. This is seen by everyone coming into neighborhood. Please have owner clean it up. Very much an eyesore. THE TRAILER THAT IS PARKED ACROSS FROM THIS ADDRESS HAS NOT MOVED IN OVER 7 DAYS. THE CODE SAYS Vehicles cannot be parked for storage purposes in the public right-of-way. Storage is when the vehicle has not been moved in five days. THIS ISSUE HAS BEEN LOOKED AT ALREADY,BUT NOTHING HAS BEEN DONE ABOUT IT OR THE PATROL CAR. Issue ID: 5689532. THE CAR MAY BE PARKED LEGALLY BUT THE TRAILER IS NOT. Thank you for submitting your concern to the Property Standards Division. This issue has been previously assigned case number 19-3464. You may visit the following site to keep up to date on the progress: https://npor-egov.aspgov.com/Click2GovCE/index.html, call our office at (941)429-7186, or email us at ceuser@cityofnorthport.com. A letter has been sent out concerning this violation, the property owner has 11 days from the date of the letter to bring into compliance, re-inspection of this case is on 4/22/19 if not in compliance it will go to the next level which will be to go before a hearing officer. If you have any other question please don't hesitate to give us a call @ 941-429-7186. Subject Property has a Basketball Hoop at the edge of the roadway. Subject Property has a Basketball Hoop at the edge of roadway. Recently a couch has been added. The city mower just drove past the vacant lot just south of this address without even slowing down again. I'm really tired of reporting this tall grass and weeds being ignored by the city year after year - is there any way you can have the mower return to address this issue before it leaves the area? We don't want to wait 30-120 days for it to be ignored again. Thank you for submitting your concern. Public Works Customer Service has created work order #19-002319 for your request. Please allow 30 business days for the tree trimming to be completed. If you have any questions or would like an update, feel free to call Public Works Customer Service at 941-240-8050. Once again, thank you for helping us make North Port a better and more beautiful community. This is the work that was performed as a result of this request. Some of the tall weeds were cut with huge clumps of weeds left at both ends as usual. Also, whatever was used to perform the work scraped off all the grass in the right of way for several feet. Now, sod needs to be brought in to fix this spot and the correct equipment for the job needs to be brought to cut the remaining ignored areas. In fact, I'd like a supervisor to respond out and look at this and post on here whether they feel it meets the standards of a completed job. I'd be ashamed to leave a job looking like this. I wish others took pride in their work as well. Somebody said I need a permit for a 20X4 foot deep vinyl above ground pool in my yard. What do I need to do? What happens when a photographer from Parks and Rec takes a picture of a AA meeting in Dallas Park and it is online for everyone to see. Regarding the party activity off Petunia; If we hear the activity going on, if we call NPPD, will they respond?